Steve Jobs serves up a pile of steaming crap to his fans, and guess what they do? Get in line for seconds. Apple TV has apparently jumped on the streaming movie rental bandwagon. Except that "Once you’ve started watching a movie, you have 24 hours to finish it or it self-destructs. And it does the same if you don’t watch it within 30 days." As I was reading this article to my wife she laughed and said, "What are they scared will happen?!" Indeed. What ARE they scared of? I can rent a movie from Blockbuster, rip it, and burn copies whenever I want. Ripping the poorer quality streamed copy from the "sealed white box" Apple TV gives me more hurdles to traverse for a less than desirable outcome. From a pirate perspective, that is. And yet, I'm sure loyal Apple fanboys and girls will stay up all night with glasses of champagne in hand, waiting for their Apple TV firmware to update so they can pay $5 for a movie they've got 24 hours to watch. Maybe they deserve what they get. 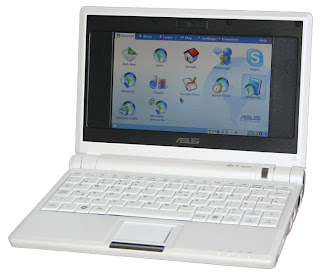 So I finally got my hands on one of those Asus Eee PC's today. Weighing in at a whopping 2lbs, with a 6" screen, a solid-state flash drive, low-voltage Celeron processor and 512MB Ram, this thing is a bargain at $299. And did I mention that it runs Linux? I have to admit that I was skeptical about the Eee after watching the Linux fanboy stampede. You could install Linux on a microwave and those guys would go nuts. I figured that with a weak processor and limited memory, it would only be an exercise in frustration. Was I ever wrong! I got to play with the Eee for three hours today and I was really impressed. It's designed to be sort of a small web browsing appliance, not an all-purpose PC. Thus the UI is very basic and task-oriented. You just click a button to "browse the web" or "make a call with Skype". The built-in wi-fi works reliably, the system boots lightning fast, and if you really want to use it as a true linux system with a full KDE experience, it's only a few apt-get commands away. Yes, the Eee is running Debian under the hood! Or rather a very polished variant. What really surprised me was the overall responsiveness of the system. Just goes to show you that you don't really NEED a muscle-computer to get the job done. Anybody else have any experience with this little gem? "As of today, you can play full-length tracks and entire albums for free on the Last.fm website. Free full-length tracks are obviously great news for listeners, but also great for artists and labels, who get paid every time someone streams a song. Music on Last.fm is perpetually monetized. This is good because artists get paid based on how popular a song is with their fans, instead of a fixed amount." The recent unpleasantness began two months ago when my good buddy Wxman asked me to grab a copy of Queen's "We Will Rock You" for him. I jumped over to the much-lauded DRM-free (giggity!) Amazon.com MP3 store. "We Will Rock You" - Check. Emailed to Wxman - Check. Five minutes later, Wxman calls. "I don't know who the hell this is, but that's NOT Freddie Mercury." Hmmm, something was rotten in the state of 70's classic rock. Two hours of searching and a Pirate Bay torrent later, I had Queen's Greatest Hits on my hard drive. Just to make sure Wxman wasn't yanking my chain, I played both tracks for my wife in a blind test. "Who the hell is that? And why can't he sing?" she asked of the Amazon.com track. After some research, it turns out that Amazon.com was not licensed to carry Queen's stuff, but they did have some "great" cover bands. Ho hum, I thought. Seventies rock is not my bag. All I needed was my indie hip-hop from Emusic, and by the next day, I had forgotten about the whole thing. Fast-forward to last weekend. I'm browsing through my local big box retailer when I "discovered" two box sets titled "Pure Disco" and "Forever 80's". The price? Ten dollars for each 3-disc set! Now I could work-out at the gym and listen to "Disco Inferno" and "Play That Funky Music"! (Yes, as I have asserted in the past, I am heterosexual. Yes, I love disco. Yes, I'm okay with people knowing this about me.) So, obviously I bought the box sets. Along with a brand new set of Skull Candy headphones so I could better hear Isaac Hayes's or Donna Summer's crooning. A few hours ago, I sat down to rip the discs and transfer them to my MP3 player. After the first disc, I noticed that the artist for each song was listed as "The Countdown Singers." Wondering what the hell was going on, I played a track. It was Kool and the Gang, "Celebration". Except, it wasn't Kool or his Gang. IT WAS THE FLIPPING COUNTDOWN SINGERS! A FRICKIN COVER BAND WHO COULDN'T CARRY A TUNE IF THE FATE OF THE ENTIRE HUMAN RACE WAS ON THE LINE! WHY???? Why wasn't there a HUGE disclaimer on each box saying, "THIS IS NOT THE REAL TEARS-FOR-FEARS, ONLY A BUNCH OF POSERS WITH FAKE BRITISH ACCENTS WHO CAN'T REALLY SING." Cover bands perform at birthdays and barmitzvahs, THEY DON'T SELL CD's! Yeah, that's EXACTLY how I felt! This little bit of Tron (and Tony Hawk) was part of a really endearing ad campaign popular on the SciFi Channel when it was hitting it's stride about 7 or 8 years ago. The year was 1999 and Farscape was the jewel in SciFi's crown, along with little gems like Lexx (damn, that chick was hot), The Invisible Man, and First Wave. And let's not forget Star Trek, The Outer Limits (new and old), and the Twilight Zone. It was a good few years for geeks on SciFi. And believe me, it didn't start out that way. The network started out running old episodes of Land of the Giants and G-Force. How far we had come! But by 2001, weird crap started to happen. SciFi sold off the rights to series' it had fought hard for. Star Trek went to TNT. And they cancelled Farscape, which was their number one money-maker at the time. By 2003, SciFi was all about it's self-made monster-of-the-week flicks, and all the good TV was just about gone. Why? Who knows? Personally, I think they were never willing to take any risks, and they failed to listen to their fans. But that's just me. I always wondered if I was the only one to mourn the passing of such a conceptually GREAT TV network. It was OUR television network, and before it imploded, it was the BEST! Apparently, I am not alone in my hatred of what SciFi has become. Entertainment Weekly has an open letter. And Penguin Pete expands on some of the themes. I especially like his sample lineup if he were the exec in charge. So, let's hear it sci-fi fans! Where do you go for your fix? Or do you still think SciFi has a heartbeat? Wake up and smell the proxy! So, apparently, Hollywood has finally exerted enough pressure with the telecoms such that AT&T and it's brethren appear ready to cave in to their demands. According to the New York Times, "AT&T and Other ISPs May Be Getting Ready to Filter"! Scandalous! That means any content that your ISP's filter deems to be "pirated" or "copyright" simply won't load in your web browser. So what's a downloader to do?! Absolutely nothing. No serious pirate worth their salt is downloading in the open anyway. Encrypted proxies (or VPN's for rent) are springing up all over the place. Giganews offers encrypted SSL downloads. Bittorrent client Azureus can similarly mask downloaded content, while also choosing to only download from others who similarly mask their content. Honest, I am!!! The holiday season is over, and very soon the blogging will continue. The weekend is near!